Like the layers of atmosphere that protect our planet from the extreme temperatures and radiation from space, facades provide buildings with the filters and shields that make them habitable for living, play, and work. In the recent Architectural Record article, “High Performance Façades,” Payette Principal and Director of Building Science Andrea Love shares how we enhance a building’s façade with research, new tools and approaches that fine-tune energy efficiency and user comfort. Our Building Science Group works side-by-side with our designers to ensure we are consistently forging new ground on issues of technical performance, sustainability and responsible design. With rigor and precision, we bring a deep technical background on building physics, exploring design solutions with state-of-the-art tools, such as early-stage energy modeling and comfort modeling, to challenge our hypotheses and develop solutions that might otherwise be unattainable. 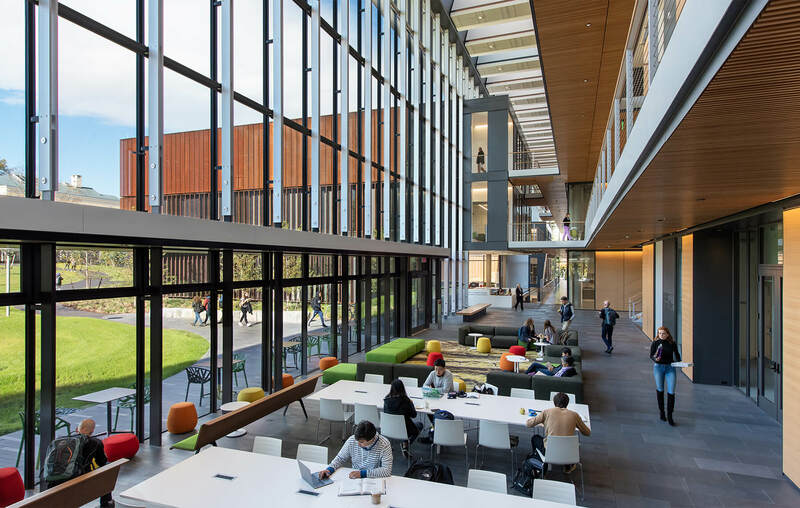 These strategies were implemented for our recently completed new Science Center at Amherst College which is designed to perform with an EUI of 91 kBtu / yr / SF, reporting a 76% reduction compared to 2030 baseline and 80% less energy than the now obsolete 50-year-old building it replaces. 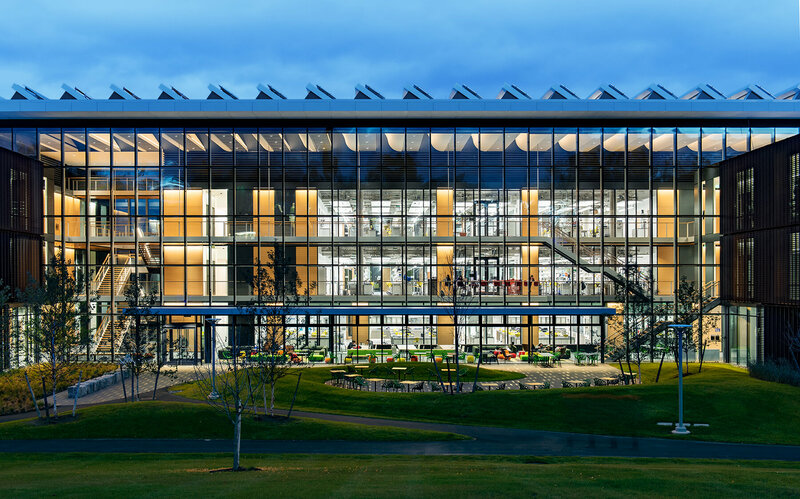 The 230,000 SF, three-story building sits at the eastern edge of the main campus in western Massachusetts, which is stretched north and south because of the configuration of the site. To connect the building to the campus, the scheme includes a highly transparent west façade enclosing a three-story atrium. Aggressive energy targets and an integrated approach to sustainability were embedded from the earliest planning stages, impacting every aspect of the project from the programmatic organization to the design of the enclosure and systems. As explained in the article, one tool our design team utilized was our Glazing and Winter Comfort Tool which determined that the perimeter heating could be eliminated in the new Science Center. Available for free on our website, the tool quantifies the effects of glazing geometry and U-value on occupant comfort and in reducing HVAC costs. Since the glazing selection for the west-facing multistory atrium was critical to the building’s energy performance, our team evaluated various options for energy efficiency and transparency. The atrium’s curtain wall is suspended from the cantilevered steel roof structure, allowing minimal mullions. To control the western sun, our design team specified internal roll-down shades that deploy automatically in four horizontal bands as the sun angle changes. In addition to avoiding glare, the setup also allows heat to be captured between the blinds and the glazing that is then vented via roof monitors to the exterior. 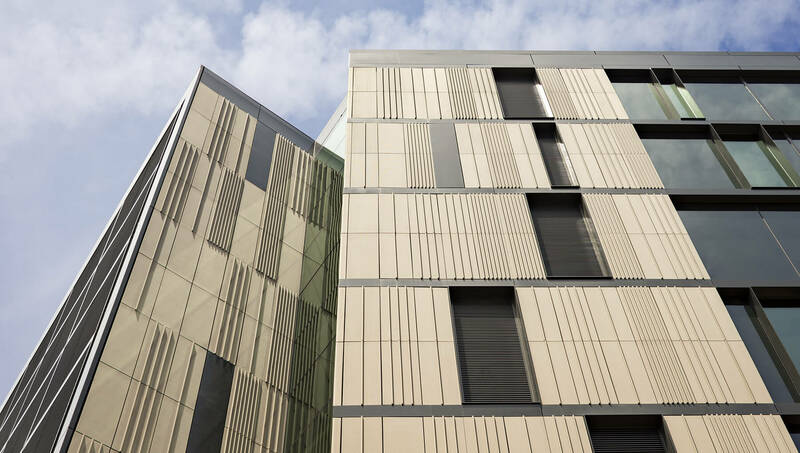 Read the article to learn further strategies for achieving a high performance façade.